Don't throw those empty beer bottles away just yet! This awesome DIY lets you turn any old beer bottle into a reusable drinking glass. Repurposing glass bottles has never been easier, and it's also a great way to transform the look of your home without spending any cash. Check out the tutorial below to learn how your empty beer bottles can become drinking glasses. If you're looking for a sustainable way to update your drinkware collection, look no further! This creative DIY is quick and easy – and all you need are a few items to get started. 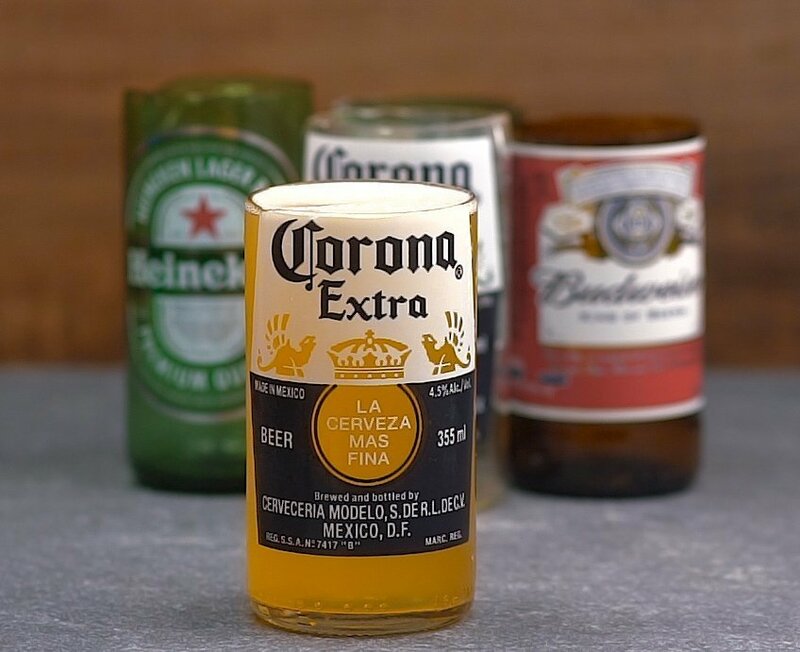 We love the unique look of these drinking glasses, and who doesn't love an excuse to drink a few beers? Check out the steps below to turn your trash into treasure! Step 1: Prepare the bottle. To remove the labels, scratch up the corner of the label. If it's dry, the glue will come off with water; if it's wet, the glue will be acetone/alcohol soluble. Step 2: Attach the bottle cutter. Don’t over tighten the clamps. You want to be able to allow the bottle to rotate freely while you’re making the score line. Once you’ve made an entire rotation, you should hear a very distinct popping sound. Stop rotating the bottle and remove the device. Step 3: Attach the separation tie. Alternate between pouring boiling hot (first) and ice cold water (second) over the separation tie. Continue pouring until the glass separates itself completely. Step 4: Sand the edges. Using a heavy grit sand paper with a little water on it will allow you to remove the sharp edges. You can follow up with a lighter sand paper grit for a nice smooth finish. Step 5: Pour a drink! Add some beer or soda to your new drinking glass. Cheers!